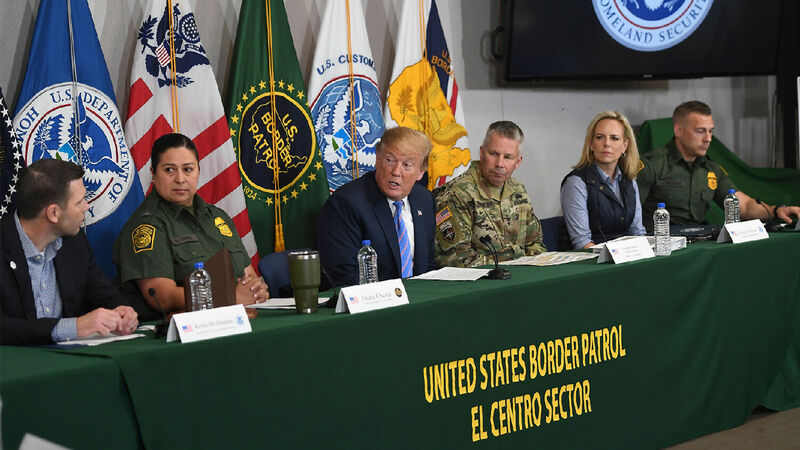 U.S. President Donald Trump speaks with members of the Border Patrol as Secretary of Homeland Security Kirstjen Nielsen looks on during an April 5 press conference in Calexico, California. The idea of the United States as a cultural and ethnic “melting pot” was propagated by the 1908 stage play of the same name. Today, that melting pot is boiling over at the southern border. Over the past several weeks, immigration services along the American-Mexican border have been overwhelmed. The crisis has reached a “breaking point,” according to the Department of Homeland Security. For the month of March, border guards were on pace to deny more would-be illegal immigrants than they have in any other one-month period over the last 12 years, a total of about 100,000. In February, over 76,000 people were denied entry into the United States. Those are just the numbers of men, women and children who have been turned away or arrested at the border. Thousands more have snuck through or have received asylum in the States. Nonprofit and federal migrant shelters are maxed out, unable to provide care for additional people. The U.S. Department of Health and Human Services is looking to cities deeper in the U.S. to give shelter to those who have successfully made it across the border. As bad as it already is, there seems to be no silver lining, and the number of aliens looking to cross the border is only rising. Mexico’s interior secretary, Olga Sanchez Cordero, said that “the mother of all caravans” is forming in Honduras, which could consist of more than 20,000 people. The largest caravan of 2018 consisted of up to 7,200 migrants. To make matters even worse, the U.S. government is so divided that legislation to fix this issue is slow in coming, if it is coming at all. In his more than two years in office, gridlock in Congress has so far restrained President Donald Trump from fulfilling his promises of a border wall—an endeavor that would certainly help stem the problem. Speaking of the immigration system in the face of this crisis, South Carolina Sen. Lindsey Graham said, “The system is broken and overwhelmed. It is a national emergency.” He went on to say that throughout the past six months, almost all illegal immigrants have been refusing to be deported or even show up in court, as required by law. In the midst of this crisis, the president’s administration has been shaken up. Department of Homeland Security Secretary Kirstjen Nielsen, a strong supporter of Mr. Trump’s immigration stance, announced her resignation on April 7. Kevin McAleenan, current Customs and Border Protection Commissioner, will for now serve as acting secretary in Nielsen’s place. Claire Grady, the acting deputy secretary, was also forced to resign. America’s overflowing border is a big problem for the administration, for border officials, for cities trying to house immigrants, and for the people of America as a whole. But more than that, it is a curse on our nation! The Trumpet watches the immigration crisis as it relates to clear prophecies in your Bible! The book of Deuteronomy records a list of blessings that God promises to the modern nations of ancient Israel if they obey His laws. (These nations are America and Britain, primarily; request a free copy of The United States and Britain in Prophecy for proof.) It also lists a string of curses that will come upon these nations if they disobey. God warns that Israel’s enemies will “besiege thee in all thy gates, until thy high and fenced walls come down, wherein thou trustedst, throughout all thy land: and he shall besiege thee in all thy gates throughout all thy land, which the Lord thy God hath given thee” (Deuteronomy 28:52). America’s border crisis is a direct fulfillment of this prophecy in Deuteronomy 28. The Prophet Isaiah also addressed this curse that would come upon the modern nations of Israel: “[Y]our land, strangers devour it in your presence, and it is desolate, as overthrown by strangers” (Isaiah 1:7). God has given America this land, but now He is allowing it to be overrun by “strangers,” or foreigners, because of the peoples’ sins. These curses are a direct result of disobedience to God! (Deuteronomy 28:15; 31:29). But why does God send these curses? It is not just to punish our nation—it is to bring us to repentance! “[I]f then their uncircumcised hearts be humbled, and they then accept of the punishment of their iniquity: Then will I remember my covenant with Jacob, and also my covenant with Isaac, and also my covenant with Abraham will I remember; and I will remember the land” (Leviticus 26:41-42). There is great hope at the end of all these curses! God uses them to bring Israel’s sins to the people’s attention. Once they repent of those sins, then He can once again pour out the blessings! America’s overflowing border is only a small part of the curses that the nation will face. But eventually, these curses will lead the nation—and the world—into a time of repentance, obedience to God, and no more sorrow at all! That is a stupendous future to look forward to! Read our free book The United States and Britain in Prophecy, by Herbert W. Armstrong, for a clear picture of what is in store for our nations in the immediate future and beyond.